Future scenarios for electric vehicle uptake are in line with those developed by the Committee on Climate Change in advice to the UK Government on the Fifth Carbon Budget in 2015. The Committee’s ‘Central scenario’ envisages electric vehicles accounting for 60% of new car and van sales (approximately 30% of the total fleet) by 2030. 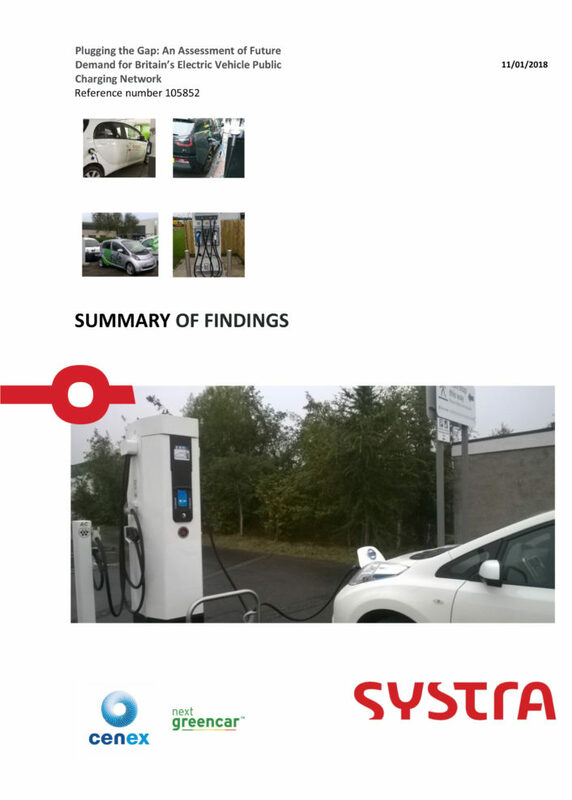 To meet long distance en route rapid charging requirements, and maximise carbon emission reductions, the number of rapid chargers located near the major roads network needs to expand from 460 in 2016 to 1,170 by 2030. The number of public chargers required to meet the 2016 level of demand for ‘top-up’ charging during parking-based charging around towns and local areas is estimated to rise from 2,700 in 2016 to over 27,000 by 2030. Overall nearly 29,000 charging points are needed across Great Britain by 2030 to meet future EV charging needs. Around 85% of these are fast (22kW) or rapid (43+kW) chargers. There are uncertainties around this estimate as the analysis relies on some key simplifying assumptions.